The world has changed – you can feel it in the water and the earth, smell it in the air. Much that once was is lost, for none now live who remember it. It began with a little-known English poet and veteran in the early 20th century, who published a fantasy book called The Hobbit. Finding success with this work, he made a much larger sequel which became a trilogy known as Lord of the Rings. The novels were the definition of a sleeper hit, being largely unknown to the mainstream but thriving in a fandom subculture all their own. And there they stayed, while fans increasingly clamored for a film adaptation that was never realized. An animated attempt by the noble Bakshi was a temporary victory, but the fandom cried out for more and were not met. And some things that should not have been forgotten were lost. History became legend. Legend became myth. And for most of the 20th century, the fantasy universe of Tolkien passed out of all mainstream knowledge, until it was found by the most unlikely creature imaginable, a New Zealand film director named Peter Jackson better known for directing ribald comedies and overwrought horror. The Lord of the Rings film trilogy adaptation, later followed by the similar attempt with The Hobbit, stands today as one of the most triumphant book-to-film works ever done. True, very true, it left out some characters and mixed together a few others, got some details off-key, but for the most part, the majority of the fan base had to be realistic and admit they couldn’t ask for much more. Not given the usual track record with adaptations, anyway! Today, Tolkien is finally recognized not just for being the most prominent example of high fantasy, but for pretty much founding the high fantasy genre single-handedly! Sure, there had been wizards, elves, and dragons in stories before, but Tolkien was the first to create a whole universe-sized legendarium out of the fabric of European mythology in total. Fantasy world games like Dungeons & Dragons and Magic: The Gathering owe it all to Tolkien, to say nothing of the hundreds of high fantasy works that have spun out from under his influence since. The LotR fandom has of course thrived all the way through the recent developments. You can’t go to a Comic-Con or a Renaissance Faire without bumping into a cosplaying Galdalf or Legolas. For every new fan who came into Tolkien via the Jackson trilogy, there’s an old couple who read the novels together and raised a happy home with children primed on the wonder and magic of hobbits and orcs. The Lord of the Rings stands today as the most popular and significant work in the high fantasy genre. And now for the merch. We reserve the right to quote the occasional Tolkien meme. Professionally Framed for years of display. 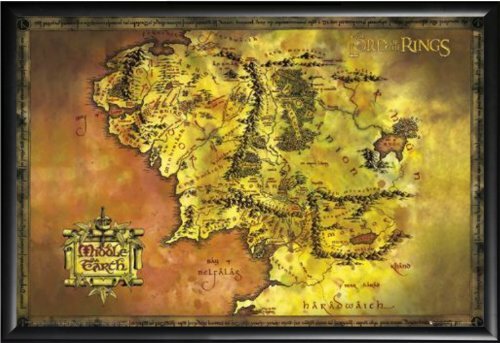 Well, you didn’t expect to stumble around Middle Earth without a map, now did you? Even if you’re not trying to simply walk into Mordor, you need a map to get anywhere without a guide, or it would serve you right if you got lost in the Dead Marshes. All kidding aside, this is a beautiful wall hanging which will proclaim your fandom to your Instagram followers and be an inspirational visit to places of imagination in your study. 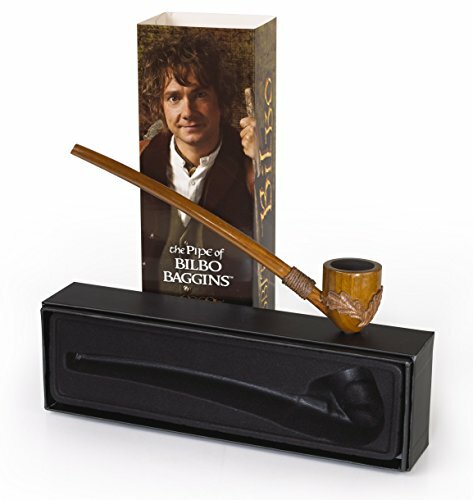 Of all the props from the trilogy to have around, a hobbit pipe is a charming display piece. It is functional for lovers of the halfling’s leaf, snicker snicker, but it comes with an attractive display for this authentic replica. By the way, we love that line of Saruman’s, where he’s saying it half-hopefully because he’s nervous about Gandalf figuring out his plans. Christopher Lee is a huge reason people love the Jackson trilogy. 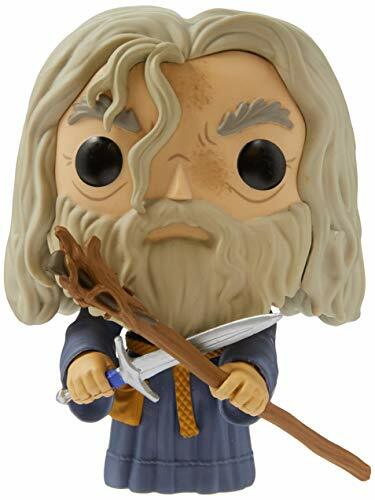 From The Lord of the Rings, Gandalf, as a stylized POP vinyl from Funko! Stylized collectable stands 3 ¾ inches tall, perfect for any The Lord of the Rings fan! Collect and display all The Lord of the Rings POP! Vinyls! We could have easily filled this whole post with Funko Pop figures, but let’s keep it down to just one, shall we? Gandalf here is worth a mention because he’s easily one of the most recognizable even outside the fandom, and in the movies, Ian McKellan gets some great hammy lines that are fun to quote. Now this is a fine bit of prop merchandise! It’s a faithful replica of the banner of Rohan, as seen in the movies. 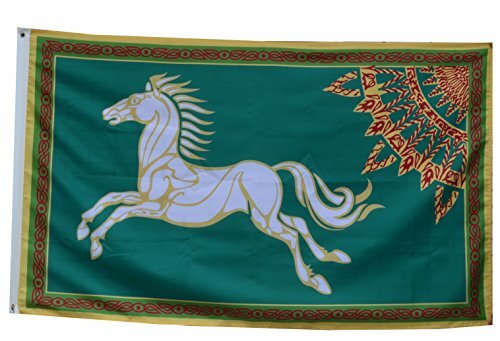 Specifically, it’s the banner which flies off the flagpole to land on the ground before Aragorn as they’re riding into Edoras. What a great metaphor for a fallen kingdom! This moment was unscritped, according to buzz; the flag came off in the wind when they were shooting and they decided to complete the shot. Board measures 15" by 15". OK, this is a bit pricier than our usual listings here at Krononaut, but when you see this set, how can you not at least pass it along? This set is huge, heavy, and detailed. The figures are sculpted pewter with likenesses of the film’s cast, and the base is a work of art all by itself. 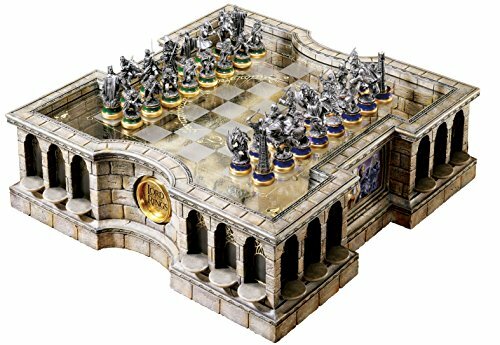 Chess with this set must feel like an epic adventure quest every game, and in between games it’s a commanding showpiece for your geek mancave. Crafted in die cast metal. 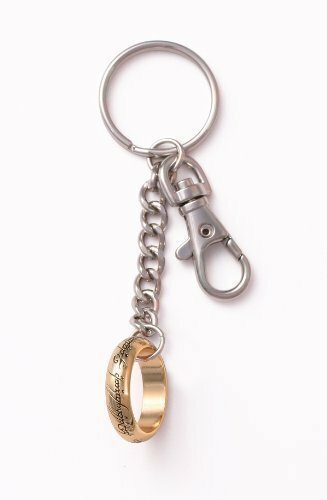 You can’t expect to do a LotR merch round-up and not include at least one ring model, but there’s also so many to choose from we dithered and went with the keychain. Hey, it’s a budget alternative if you’re broke from buying that chess set! Plus a keychain is the perfect medium for the Ring of Power. Who’s going to lose their keys when they have The Precious attached to them?